Did first DDOS attack sink the Titanic? When the RMS Titanic set sail on her maiden voyage from Southampton, England, to New York, on April 10, 1912, she was considered the ultimate passenger liner — unparalleled in luxury, size and technology. The legendary British ocean liner that struck an iceberg and sank hours later in the North Atlantic Ocean on April 15, 1912, clearly wouldn’t be considered a high-tech vessel today. 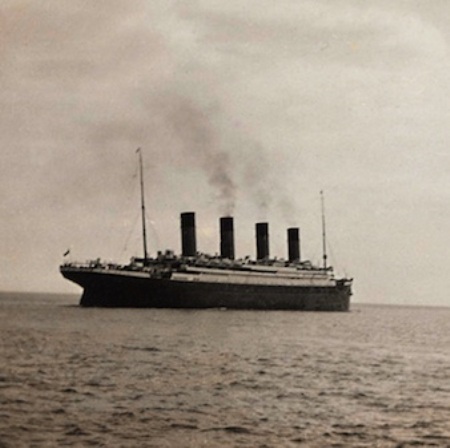 But when the ship set sail with 2,228 passengers and crew members amid great fanfare on an April afternoon 100 years ago, the Titanic was a marvel of state-of-the-art technology that captured the world’s interest. The Titanic, for instance, had an electrical control panel that was 30 to 40 feet long. The panel controlled all of the fans, generators and lighting on the ship. It also controlled the condensers that turned steam back into water, along with the few machines that took salt out of ocean water to make it drinkable. The Titanic also had a master-and-slave setup for all of the clocks onboard. The central clock was on the bridge, and as the captain adjusted the time on that one clock, all the clocks on the ship would register the change as the ship sailed through different time zones. There also were four elevators on the Titanic, which was fairly new technology on a ship. A few first-class cabins also had telephones, although the phone could not make ship-to-shore calls. 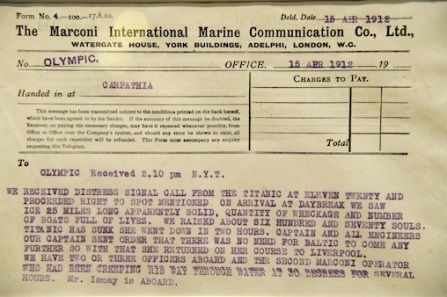 The crowning technical glory on the Titanic was the advanced wireless communications setup for Morse Code, which was considered the most powerful setup in use at the time. The main transmitter was housed in what was dubbed the Marconi Room, named after Italian inventor Guglielmo Marconi, who was known as the father of long-distance radio transmissions. The transmitter’s antenna was strung between the ship’s masts, some 250 feet above the ocean’s surface. Most ships of the day could transmit messages a distance of 100 to 150 miles during the day, according to Trower, a contributor to the Titanic Commutator, the Titanic Historical Society’s magazine. However, the Titanic’s wireless system was capable of transmitting messages for 500 miles during the day and 2,000 miles at night. However, many people say the chief wireless operator and the wireless system, or at least how it was used, were part of a string of problems that led to the ship’s tragic sinking. According to both Vadus and Trower, passengers were so excited about their cross-sea excursion and the opportunity to send wireless messages to friends and family at home that they overwhelmed the wireless operators and the machine with personal messages. The wireless operators, inundated with messages to send, became overworked and tired. That was going to be a critical mistake. Phillips meant that he was busy relaying messages to a wireless station in Cape Race, Newfoundland, about 800 miles away. The Californian didn’t respond to the Titanic’s distress signals because its wireless operator had gone to bed after being rebuffed about his iceberg warning. About 10 minutes later, the Titanic’s lookout spotted an iceberg 500 yards away and called out an alarm. The Titanic struck the iceberg, ripping openings in the hull along the starboard side near the bow. Around 12:30 a.m. on April 15, less than an hour after the ship hit the iceberg, the Titanic began to sink. The forward part of the ship’s deck started to go underwater at 2:05 a.m., according to Trower. Both the bridge and the wireless room were located on the upper part of that section of the ship. The bridge went under shortly thereafter. As the ship’s bow went under, the stern rose into the air. According to Trower, Phillips, the wireless operator, is believed to have stayed in the Marconi room, sending out distress messages as late as 2:17 a.m. when water was rushing in. Harold Bride, the second wireless operator and a survivor, later reported that he entered the wireless room and found a man trying to steal the life jacket off Phillips’ back. Phillips was so engrossed in sending out distress calls that he hadn’t even noticed. The ship sank at 2:20 a.m., and Phillips was among those who perished. Reports vary, but it’s widely believed that 705 people survived the tragedy and 1,517 died. The survivors, in lifeboats, were later picked up by the RMS Carpathia. If the Titanic had been equipped with sonar and radar technology, the tragedy would likely have not occurred. However, sonar was still in the experimental stage in 1912, and the development of radar was still more than 20 years in the future. Sharon Gaudin covers the Internet and Web 2.0, emerging technologies, and desktop and laptop chips for Computerworld. Follow Sharon on Twitter at @sgaudin or subscribe to Sharon’s RSS feed. Her email address is sgaudin@computerworld.com. Read more about mobile and wireless in Computerworld’s Mobile and Wireless Topic Centre.